Only 20 spots available per month! Hop on your bike or take advantage of Coast Bike Share and join us for a leisurely Mural Tour ride with numerous stops. Learn more about these dynamic murals and the power of public art in St. Pete! Must be 18 or older to rent a bike. Teens w/bike ok if accompanied by an adult. Please arrive 15 minutes early to sign waiver and brief safety demo. Mural tours by bicycle will happen the 1st Saturday of every month 9:00 – 11:30 a.m. (April Tour is 2:00 – 4:30 p.m.) and are open to anyone 18 years and older, with or without your own bike*! Florida CraftArt just became a Bicycle Friendly Business (BFB), as part of the League of American Bicyclist program. One of over 1,500 businesses in all 50 states have earned the title since 2008. Tours will meet at the greenspace across the intersection diagonally from Florida CraftArt, 501 Central Ave. in downtown St. Petersburg. Limited to 20 riders for safety. Tour includes over 30 murals, background on the SHINE murals, artists and their inspiration. 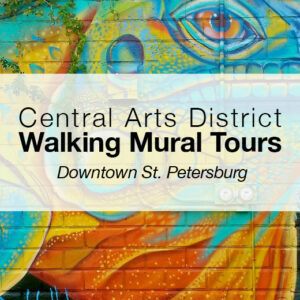 Mural Tour ride is approximately 10 miles, covering the back streets and alleys of four Arts Districts. 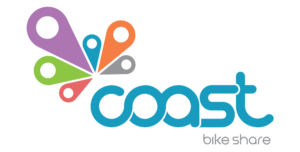 Every attendee also receives one free month of Coast Bike Share’s monthly membership, which comes with 60 minutes of ride time every day, to try the bike share system again at their leisure. A portion of the proceeds from the tours will be used to fund future murals. Reservations are required so we can have tour guides available for you. Wear comfortable shoes and cycling appropriate clothing. Second Saturday Gallery Walks, 5:30 – 8:30 p.m.